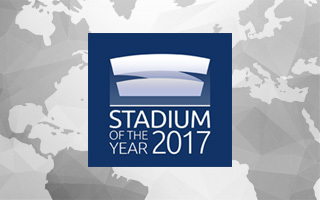 Stadium of the Year 2017: Let the vote begin! 27 stadiums from 19 countries begin the fight to become Stadium of the Year 2017. It's up to you which one will grab the title as we invite you to take part in the 8th Public Vote, the largest competition of its kind worldwide! We're pleased to announce that the voting system is ready to be heated up by your activity. So you may as well go check out the list of candidates now and choose your favourite stadiums opened in 2017. Every internet user can take part in selecting the most unique, beautiful or impressive stadium opened over the past 12 months. The vote will remain open until and including March 4. It's up to you what criteria you use during the vote. All we ask for is for you to choose not only the one most favourite stadium, but also four others that you find worthy of attention. Please give stars to the best stadium and then select four more, awarding them 4, 3, 2 and 1 star. Once you have no stars left, the Vote button will activate itself. Click it and you're done. Please mind, only one vote from a specific device will be counted. In many ways it's going to be a unique competition, largely thanks to your involvement in the nomination process. You have submitted over 40 stadiums for our consideration, from which we selected the final list of 27 nominees. Why not all 40+? Some of them were simply opened too late or still await to be fully inaugurated, like the stadia in Aue, Balikpapan, Hangzhou, Izmit or Perth. All of them will of course be eligible to run this time next year. Others didn't meet our criteria for various reasons. As an example, Khalifa International Stadium hasn't gone through enough work to treat is as a new stadium, regardless of how amazing it is, while Haladas Stadium in Hungary is simply too small and Wroclaw's Stadion Olimpijski doesn't enable football games to be played. Sadly, this year there were also nominees which did meet all criteria to the best of our knowledge, but we weren't able to get either images of them or credible information about these venues. We were thus unable to give you enough data to vote on them. Yes, this mostly concerns Chinese stadiums, which should be represented strongly next year. Despite all the above exceptions, it's a fascinating list of candidates. With the smallest ever representation of Western Europe and curious debuts from countries never before involved: Argentina, Ecuador, Gabon, Iran, Malawi and Turkmenistan. For the second consecutive year Turkey tops the list in terms of number of stadiums with 4 modern venues opened last year. Starting today the voting platform is open, but once more we will see two titles of Stadium of the Year awarded. One from the Public and another selected by Jury of experts – architects with experience and expertise in stadium design. The Jury will begin work on February 1, selecting first a shortlist of 10 finalists and then the very best stadium opened last year. Full list of Jury members will be published shortly. Now we can reveal that for the first time the Jury will involve a female architect. About time! After all, women also design fantastic architecture and should vote on it as well!